The Soyuz TMA-03M spacecraft that will carry new Expedition 30 Flight Engineers Oleg Kononenko, Don Pettit and Andre Kuipers into space rolled out to the launch pad Monday at Baikonur Cosmodrome in Kazakhstan. The launch is scheduled for Wednesday at 8:16 a.m. EST, with NASA TV coverage beginning at 7:30 a.m. 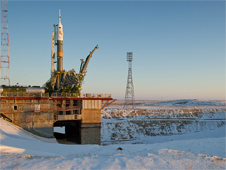 The Soyuz will dock to the International Space Station Friday morning.